Transportation has always been a male-dominated field, with women often discouraged or outright banned from participating in the industry. However, many woman have overcome these challenges, proven their ability to do the job, and lobbied to get all-male unions and associations to change their rules. In honor of Women’s History Month, we’re highlighting just a few of the many women who have been involved in the transit industry. Anne Bush was the first woman in the United States to receive a driver’s license, which at that time was called a “steam engineer’s license,” in the year 1900. Alice Huyler Ramsey was the first woman to drive from one coast of the United States to the other. She took three other women with her, and they traveled with no maps and often on dirt roads . She said,“if we got lost, we’d take to the high ground and search the horizon for the nearest telephone poles with the most wires. It was a sure way of locating the transcontinental railroad which we knew would lead us back to civilization.” She later began racing cars against men and frequently won. In 1922, Helen Shultz started the Red Ball Transportation Company. She dealt with heavy rains destroying the roads her buses traveled on and various financial struggles, but she capitalized on the newspapers calling her the “Iowa Bus Queen.” She eventually sold the business for $200,000. Mary Walton received a patent in 1879 for a device that filtered smokestack emissions through water to clean the air of pollutants. The device was used on trains in New York City. Mary then received a patent for a sound dampening system that she sold to the Metropolitan Railroad of New York City. Olive Dennis was the second woman to graduate college with a civil engineering degree, and she became the engineer of service for the B&O railroad. She received a patent for her invention of the Dennis ventilator, and she contributed to the invention and design of air-conditioned coaches, dimmers on overhead lights, individual reclining seats, and stain-resistant upholstery. She was also the first woman to be a member of the American Railway Engineering Association. For more reading on these women, see Women in Transportation: Changing America’s History. Kathleen Andrews was a bus driver and transport Manager. She was the first woman to become a Transit Operator, Dispatcher and Manager in Alberta, Canada. Read more about Kathleen Andrews here. Joyce Barry was the first woman to become a tram driver in Australia. She started as a conductor during WWII, and when all of the other female conductors were fired after the war was over, she was rehired. The tramway union objected to women becoming drivers because of the strength it took to use the manual handbrake and the ability it took to climb onto the roof and retrieve the trolley-pole if the trolley-rope broke. Having experience felling trees, driving tractors and milking cows, Joyce thought these objections were “‘complete balderdash.” The union went so far as to go on strike to protest the training of Joyce and another woman, Catherine Stone. In 1975, nearly 20 years after the union passed a resolution to forbid female drivers, the resolution was rescinded, and Joyce became Australia’s first female tram driver. She worked as a driver for the next seven years. Read more about Joyce Barry here. Karen Harrison was the first female train driver in Britain. She applied with the British Rail at only 16 years old, and when the recruiters met her and found out she was a woman, they tried to get her to become a secretary instead. She said her career was “Ten years of hell, ten years of heaven,” because she enjoyed the job, but had to endure verbal and physical abuse from her male coworkers. She was also an active trade unionist and eventually presided over the train driver’s union’s annual conference. Rosa Parks is an icon of the defeat of the Jim Crow laws of racial segregation in the United States. She refused to give up her bus seat to a white passenger in an act of protest and was subsequently arrested. She followed in the footsteps of other African Americans who had protested in a similar way, such as Irene Morgan, Sarah Louise Keys and several other women and men. She became a symbol of the Montgomery Bus Boycott, and worked with other civil rights leaders such as Edgar Nixon and Martin Luther King Jr. She was fired from her job as a seamstress and received many death threats. The Women’s Political Council was the first group to endorse the bus boycott, and then the movement quickly spread as 40,000 African American bus commuters walked and took carpools rather than taking the bus. Rosa Parks was considered by black community leaders to be the perfect plaintiff for their legal case, as she was a mature, responsible woman with steady employment. The boycott continued for 381 days, and the supreme court finally ruled on a different case, Browder vs. Gayle, that segregation on buses was unconstitutional. Rosa Parks is known around the world as a leader in the civil rights movement. Read more about Rosa Parks here. 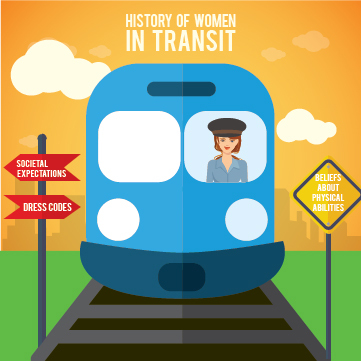 The history of women in transit has been a long, hard road, but today, women are involved in every level of transit. They are still a much smaller percentage of the total transit workforce, however, especially in management positions. In some cities in the US, women make up 36% of all transit employees, but only 4% of transportation companies having 50% or more women in management positions. Read more here. We’d love to hear from you! Do you have a story about being a female first in the transit industry? Or how your gender has influenced your opportunities and advancement? How has working with women expanded your company’s perspective and vision?